Opinions expressed in the blog posts are entirely that of the contributors. We do not participate in advertising or product endorsement or other commercial partnerships. Please view our review policy and feel free to contact us. The contents of the posts and comments expressed here belong to individuals who write them. "Long ago and far away," we enter a village that has a gushing river, on the banks of which our baby girl, Chandra, is born. For a brief childhood spell, she basks in the music of her mother's flute, growing up without a care in the world. Then her world is turned upside down all of a sudden. A flood sweeps away both her parents, who push her up to safety, handing her the flute, before they pass away. Reluctantly taken in by her aunt and uncle who treat her harshly with nary a kind word, piling brutal workload on her to "earn her keep," Chandra carries on, deriving solace from playing her mother's flute when she can manage it, away from her disapproving uncle and aunt. But then, much like the twists and turns of fate in fairy tales, her uncle and aunt pluck the flute from her in a fit of anger and toss it into the river. But, Chandra carries on with the chores, bearing the abuses with quiet resignation, through the bitter winter and the searing summer, starving, yet surviving. And then, one day, as she sits by the river bank, hunger gnawing, she hears a hopeful, almost cheerful music, just like her mother used to make. And out of the river appears a plantain leaf laden with simple yet sumptuous meal. Day after day, she is fed by the mysterious provider. Until her uncle and aunt find out and accuse her of unimaginable things. Finally, when the monsoon arrives after a long parched summer, it was a relief at first. But then, it rains and rains causing the river to rise. In an abominable act of cruelty, her aunt and uncle push Chandra down as they go higher up to safety, letting her get washed away in the flood. This is the turning point in Chandra's life, when desolation and misery give way to hope and comfort. When one has reached the bottom, there is no way but up. And so it is with Chandra. She clings to hope and emerges safely, adopted by a loving family who have lost their child to the same flood. The illustrations by renowned artist, Pulak Biswas, in a limited palette of bright blue and red, contrasting with whites, blacks and grays, is stunning! I first encountered Mr.Biswas in Tiger on a Tree - again a distinctively stark black and orange palette, reminiscent of the tiger in that book as well. 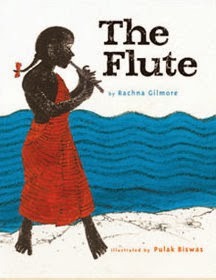 In The Flute, the moods and atmosphere is expertly conveyed - from the gentle rippling of the river as Chandra sits by her mother's feet and listens to the flute, to the rush of the furious flood; the expressions of the aunt and uncle; even the waxing and waning moon. Rachna Gilmore has an uncanny ability to use the exact words, only as many as needed - no more, no less., and yet tell a story in the most profuse way possible. For a while, when we read Catching Time, Making Grizzle Grow, and A Screaming Kind of Day, I told myself that I want to grow up to write just like her some day. With the many natural disasters around the world, when we read about the strength and resilience of children in the wake of utter devastation, we can't help but be inspired. Chandra, though fictional, could be any one of the children we never get to read about in the news stories. Disclosure: While the book was a review copy, the views expressed here and the decision to share it here is my own. The review me to tears Sheela! Will keep an eye out for this book. I meant "moved me to"